The photo is not actually a picture of all my finishes, but rather all the finishes that made the blog. I have a few that I did during the year that never made the blog for one reason or another, plus I made a few this December that I have not posted about yet. In the above, I have quilts, pillows, crochet, knit, baking and other sewing projects. Oops, I just noticed that I am missing at least one finish, but it is time to go sledding with the kids. During the month of December (from the 1st through the 24th) there are 4 days that my kids do not have sports. As of today there are 3 days and one of those days is Christmas Eve. This means, I need to carefully plan this month in order to fit everything in. Yesterday, I was able to squeeze in some sewing time. Yay! First up on my list was the Farmer's Wife block that I picked colours for 2 weeks ago. 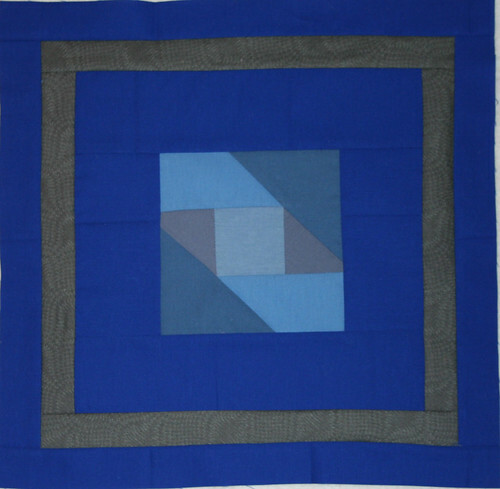 I hand pieced this one again. It was so much fun doing the last one that I couldn't help myself, the added bonus of hand sewing is that I can take it to work and sew on my lunch break. (This would qualify as the S-L-O-W in the title of today's post). I really need to find my high gear and commit to finishing this quilt soon. Hopefully I can get serious in the new year. What is the fast one? This quilt top that I started yesterday. It will be a Christmas gift for a young girl when it is complete. I think it is the sweetest quilt. It comes from a quilt kit that I bought a few months ago. 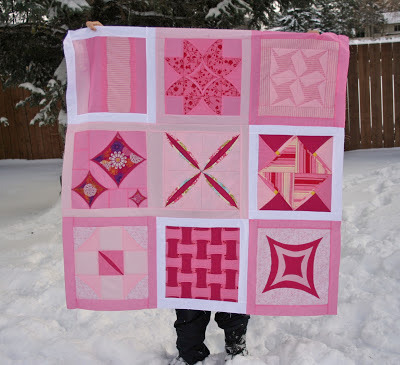 I was not sure if I was going to have time to complete it or not, so I left it off my to do list, but after my unsuccessful day of shopping on Monday I decided I must make this quilt. The quilt is a lap size quilt (42" X 68" - I didn't measure, but that is what the kit said). The bow on the front is an applique. 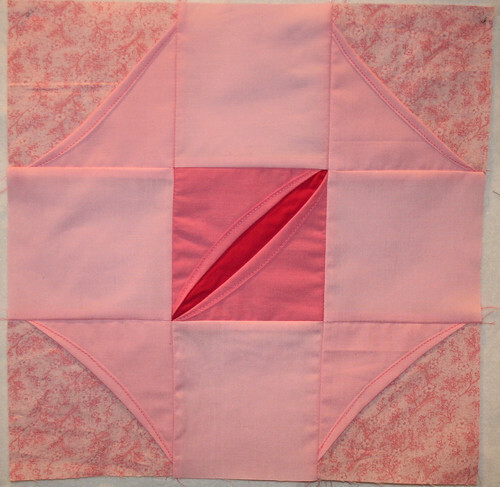 I used double sided fusible interfacing to position the bow then I zig-zagged around the edges to secure it. Now, I have a problem! 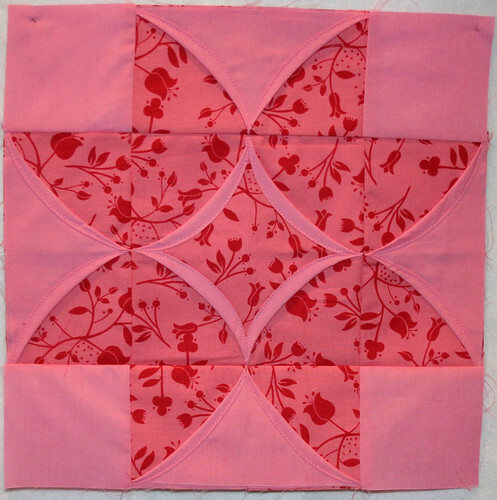 When I bought the quilt kit online, I also bought the recommended backing fabric. The fabric clashes SOOOO bad! 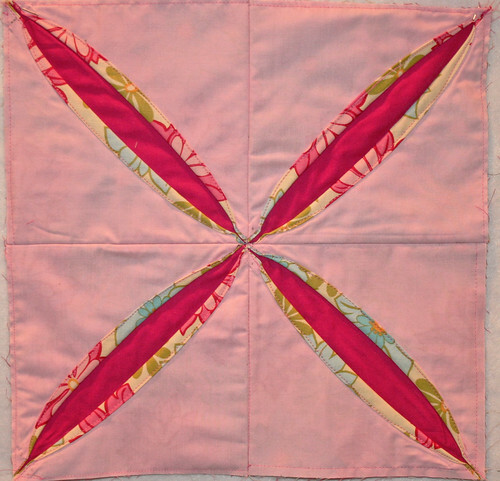 The quilt is pink and the backing is orange-red. There is nothing in the quilt that coordinates with it. So, I looked through my stash and all I could find was 3 more fabrics that do not match. Now you can help me. 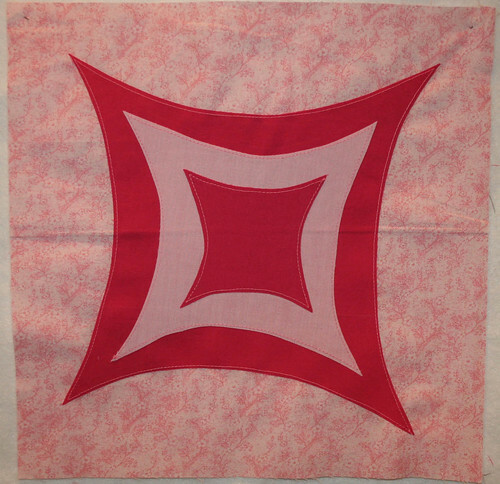 I have to buy a backing for this quilt. The finished quilt will be going to a young girl. What type of backing fabric would you use? If you follow my blog you will discover what seems to be a very unfocused crafter. I plan projects and take months/years to finish them. I seem to be unable to control myself when it comes to starting new projects. I do eventually finish everything and I am happy to say that my skills are improving with each new project. 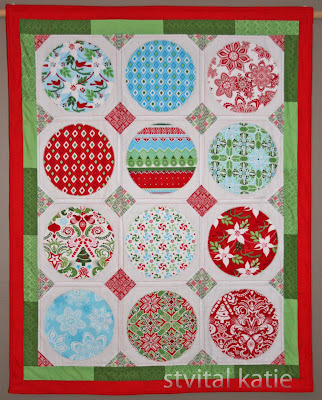 Last week I was working on my Flurry Wall Quilt which is finished! Then, a very special Auntie of mine gifted me almost a whole bolt of Santa Fabric from Ikea that she purchased last year. 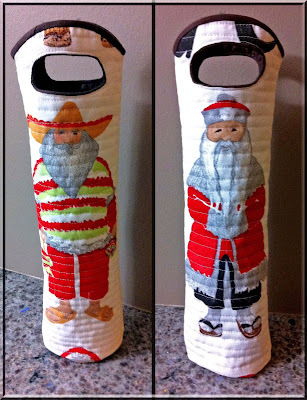 Of course I had to make something with it, enter one wine tote (See Below) and an Apron (no picture). I followed the following tutorial from Needle and Spatula for the wine totes. Yesterday I had no time, so of course I picked up some fabric at lunch and made another new project. Mittens! I bought the pattern from Fibers and Twigs on Etsy. The outer of my mitts are not stretchy so I had to go up a couple sizes, but I think they came out great. 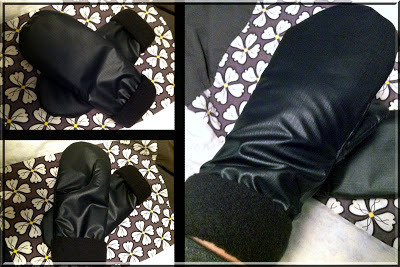 I look forward to making many more mittens in my future. 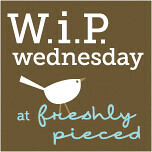 I am linking up with WIP Wesdnesday over at Freshly Pieced. My featured WIP's are two that I shared last week. One little picture of my completed project. I struggle to take decent pictures, I rarely have daylight when it is time to take a photo, so I will share my one picture with you today! I started this wall hanging in November of 2011. It was not a hard quilt and I don't think I have too many hours invested in it, but I picked it up and worked on it little by little. I am VERY happy to have finally finished and to have it hung up for the Christmas season. Size: approx. 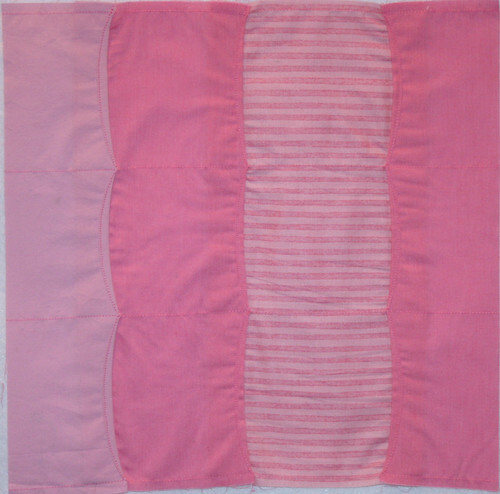 36" x 66"
Quilting: I kept it simple, stitch 1/4" from seams. I have too many works in progress' (WIP) to share with you, so I will limit it to three today. First is my Flurry Wall Quilt. I shared the below picture on my blog before, and I have worked on it since then but do not have a recent photo. I brought it to work with me today, hopefully I will get some of the binding done over my lunch hour. Next is a peak at a little embroidery pattern I am going to make for myself. The plan is to hang it in my office at work. I drafted the pattern myself and have not picked all of the colours I will use in it yet (my floss is a mess, I picked the most presentable for the photo). The last WIP of the day is the next block in my Farmer's Wife quilt. My daughter wanted to see more purple and blues in her quilt, so here are my fabric choices. (I think the fabrics match better in real life then in my photo). 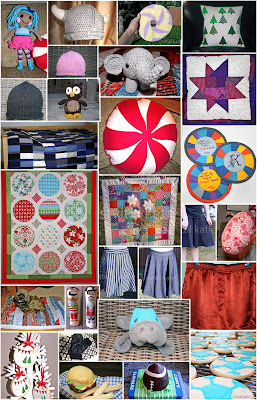 I am linking up with Lee at Freshly Pieced. I have been working on projects that I would love to share, however, I seem to have a hard time getting pictures taken. I worked a few more of my farmer wife blocks up to the larger size. This is working great, especially since not all of my original blocks are the same size. 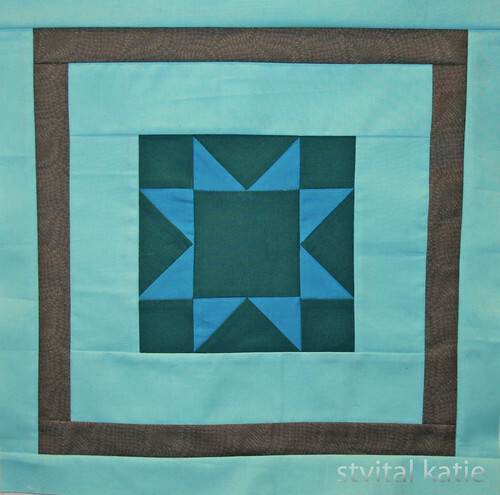 Last, but certainly not least, I hand pieced one block. I had to do this because I promised my daughter that I would work on her quilt and with my sewing machine in the shop this is the only way I could keep my promise. To tell you the truth, it was simple and I don't think it took me longer than sewing by machine. With machine sewing I am back and forth from the sewing machine to the ironing board. 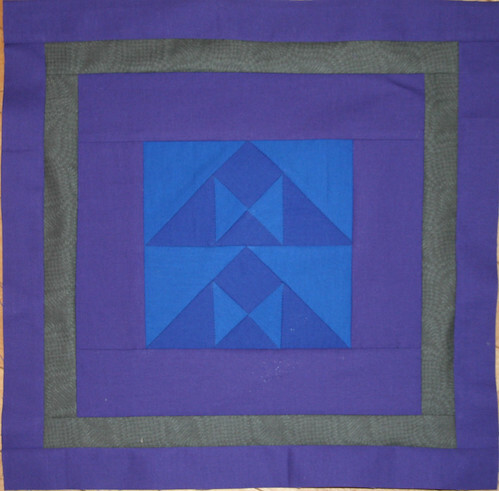 Hand sewing, I sat in the corner of my couch and sewed the whole block, then ironed it. It was quite relaxing. My Quilt top is done! 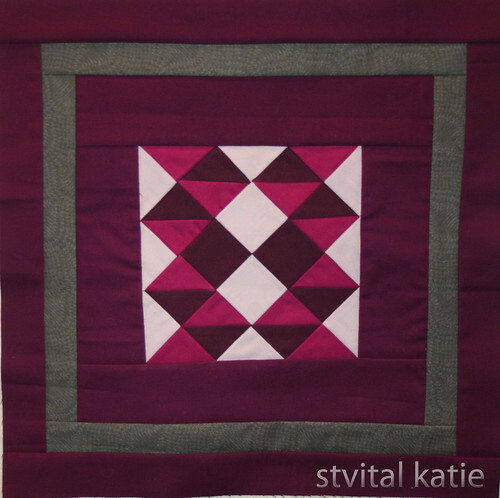 I am having a hard time writing about this quilt because my motivation for creating it was not the same as most of my projects. I will start by saying that I have always wanted to make cathedral windows. I still do, since these are not traditional cathedral windows. Some of these blocks were really fun to put together, some I did not enjoy as much. There is one in the bottom left of the photograph that reminds me of something, which I will not say out loud. If you don't see it yourself think about Everybody Loves Raymond: Season 6, Episode 5 Marie's Sculpture. Oops. 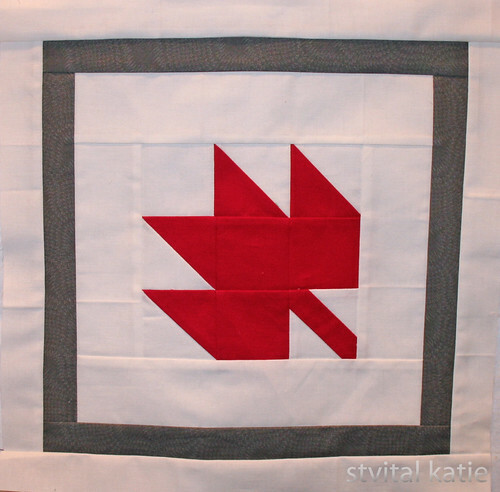 This quilt will be perfect for Valentine's Day. My attraction towards Valentine's Day is growing. I have never 'celebrated' the day with my husband, I have always thought it was a highly commercialized day and that it is better to celebrate your love everyday of the year. However, I now have children in school and they celebrate Valentine's Day at school, so I have fun with them making Valentine's cards for their classmates. The quilt will be a fun addition to our home at that time. 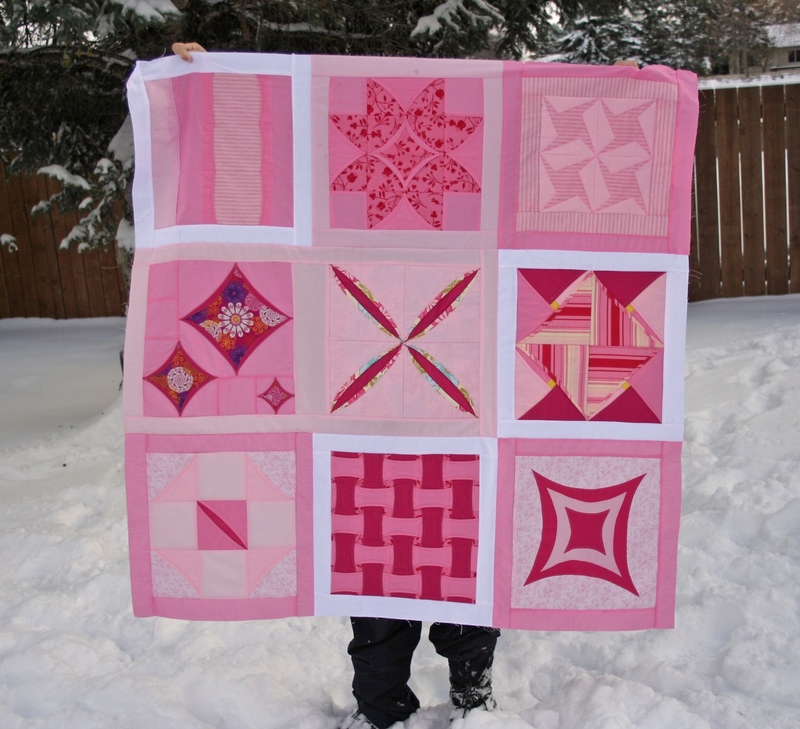 The top picture is cropped to showcase the quilt top, but check out the snow in the picture below. We received all of the snow this past weekend. It was a nice steady snow, the kids are thrilled! Because I shared all of the other blocks on their own, here is Block 8. The instructions for it can be found here. 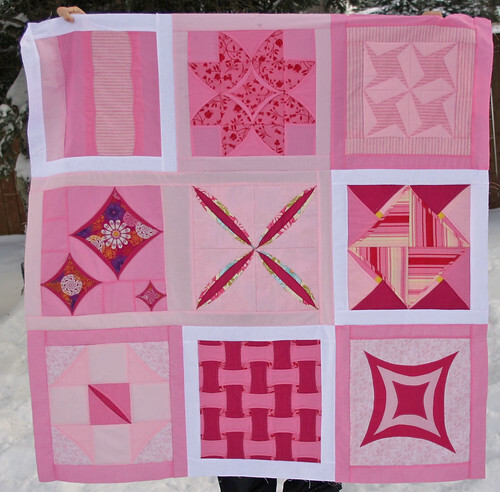 The deadline is approaching for the completion of this Quilt-a-Long. All blocks and assembled top must be submitted to Flickr by November 15, 2012. Last night I worked on 4 blocks. Only one left to do! My pictures were taken during the middle of the night, so as usual my colours may not be true. I started block 5 a couple weeks ago, so last night I simply had to pick up where I left off and finish the block. The instructions for it can be found here. With this block I pictured the block moving from dark to light. It sort of worked, not as well as I had hoped though. The instructions for Block 6 can be found here. I have to say this block was my favourite one to construct so far. It seemed to just work and I love how it turned out in the end. Instructions for Block 9 can be found here. Check out the Flickr group to see what others are making, or join in yourself. We had a great day yesterday! We celebrated my husbands Birthday and the kids had fun partying at school, trick-or-treating and eating candy. The kids LOVE trick-or-treating, the neighborhood seems to have a mixture of people. Many who close their door to Halloween and some who go all out. The kids loved seeing the people go all out, not just with decorations, but dressing up and interacting with their "guests". Fun. I didn't take any action pictures of the kids, so I will share them posing in the house. Do you love my pink and grey 80's wallpaper? 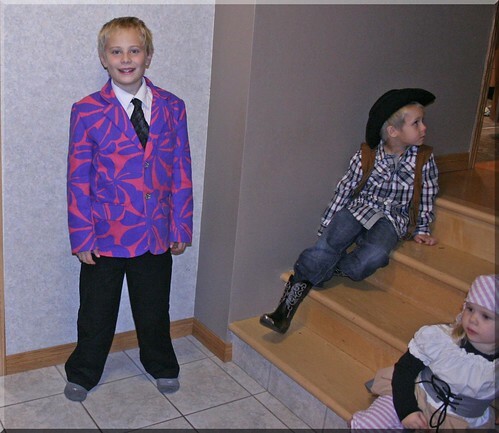 To start with, here is my oldest son in his Don Cherry outfit. 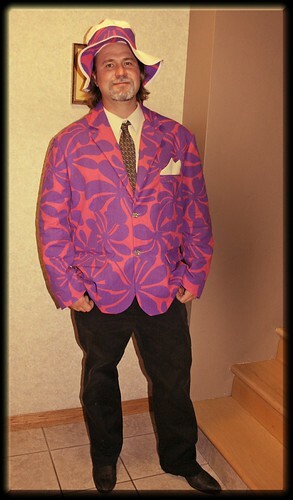 Just like with his Dad's costume, I made the jacket and put together the rest of the costume with existing items. I really should have taken some close up pictures of the jacket, it has welt pockets and great flower buttons. There is a lot of detail that went into the suit jackets. Next up is my Cat. My inspiration for this costume was a picture of a, shall we say "dressed up" lady. 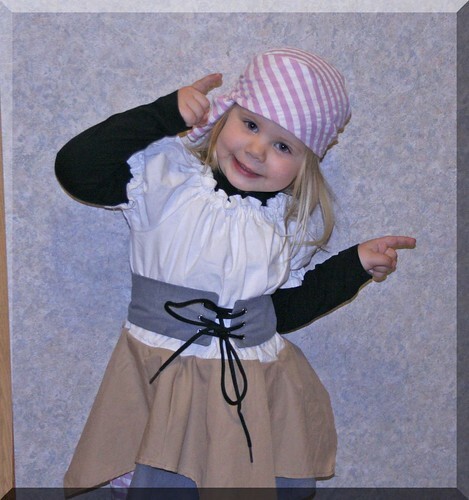 However, I was able to see the great costume in the photo and made an age appropriate costume for my girl. Here she is, my daughter the cat. 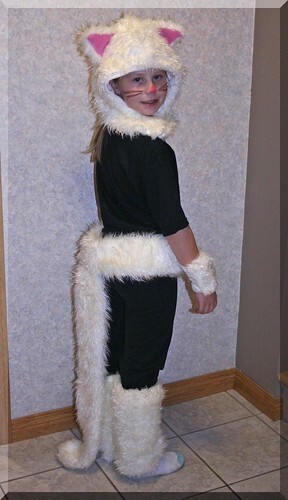 I made all the faux fur parts of the costume and sized a men's t-shirt to fit her. I used this for inspiration for the cat hood. I love how it came out. The rest of the costume was very simple. Measure around my girl, cut rectangles to size and sew together. The wrist and leg warmers and hat are lined with jersey. The belt and hood do up with snaps. (I love my snap pliers.) The arm and leg warmers pull on. My daughters favourite part of her costume was her long tail. 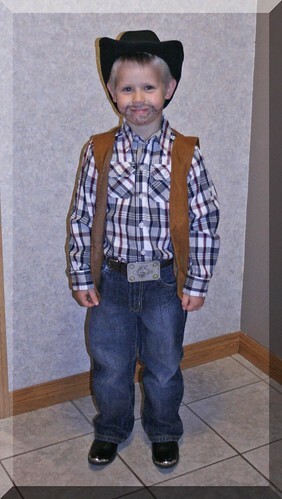 Next up is my little cowboy. 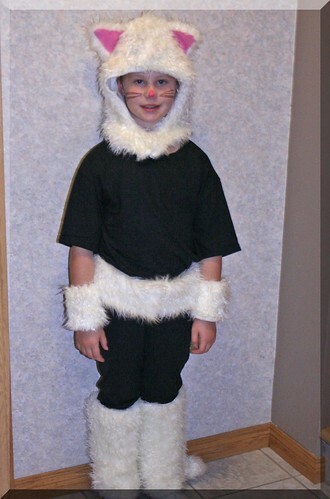 He told me he had the best costume in his class! His was mainly pieced together, I did make the vest and the belt buckle. The vest is made from an old shirt of mine that I no longer wore and the buckle is a picture of a real belt buckle, that I printed and coloured, then placed in a plastic cover and attached to his belt. Last, but not least is my wee girl. I made her costume 5 years ago. Her big sister wore it when she was the same age. In the picture she has a long sleeve shirt under because we are about to go trick-or-treating, but other than that I made the whole costume. Besides being cute, I am not really sure what she is doing in this picture, ha ha. Last photo, the kids patiently waiting while we get ready to go out. I hope you all had a safe and fun Halloween. One costume is complete! Well, actually two, but I bought one of them. 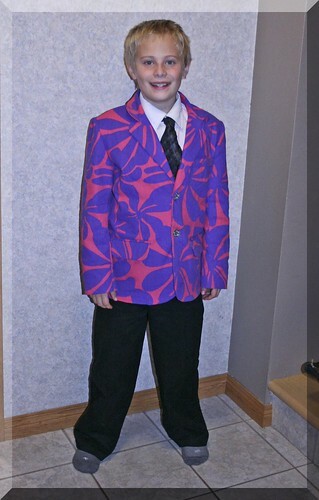 Last year after Halloween my 9 year old decided he wanted to be Don Cherry for Halloween in 2012. My husband jumped on board, so I found some great fabric on sale and bought a couple of great patterns from Kwik Sew (mens and boys). 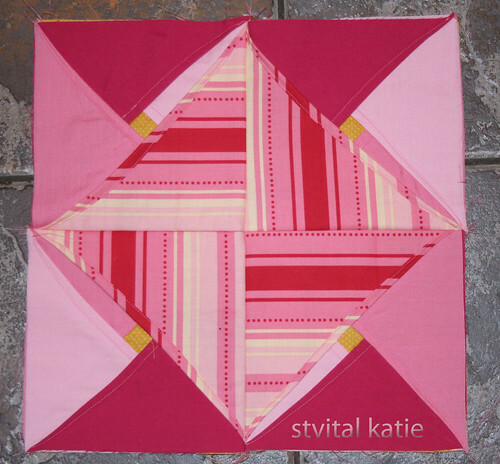 I really like working with Kwik Sew patterns. They have great instructions. 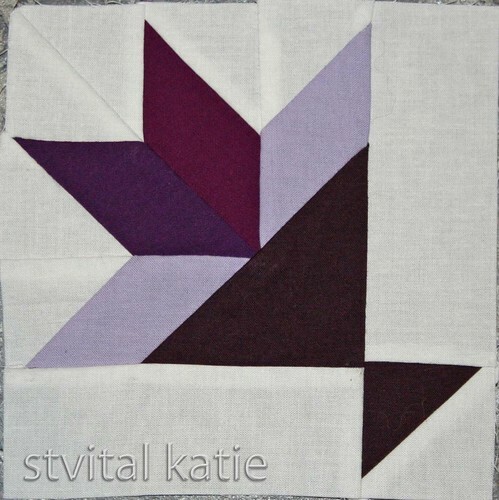 I would not hesitate to buy another Kwik Sew pattern. 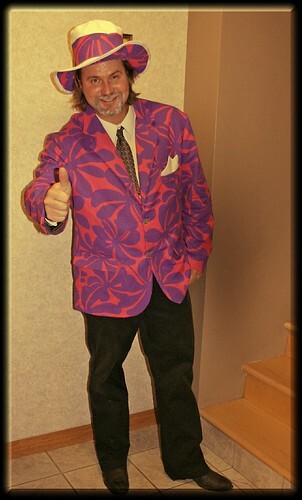 Please welcome my husband in his costume, Don Cherry. The pants, shirt and tie are store bought (and already in his closet). The jacket, hankie and hat are made by me. The hat was very last minute. My husband has longish hair and was not going to cut it for Halloween, so we decided a crazy Don Cherry hat would be in order. Just a few short hours before the party we were attending, I measured his head and whipped up a hat. I was very impressed with myself for being able to draft a hat in my head and sew it up. I think it took approximately 45 minutes. I made a witch hat last year (and a few others so I had an idea of what I was doing). My costume is next, a ghost lady. Again, I did not sew any part of my costume, but I am sharing because of my great find. 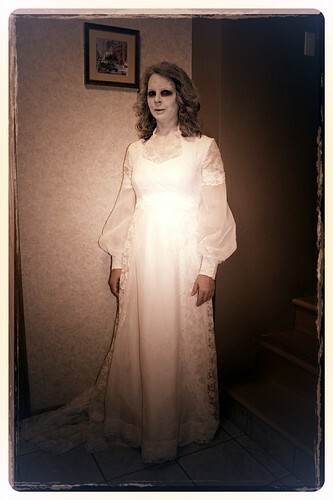 I found a previously worn wedding dress that was absolutely perfect for a ghost at a great deal. It is classic, flowing and big bonus, it fit (I did have a little concern about doing up the zipper, but in the end it was perfect). We generally try to dress up in a couple costume, but this year we went our own ways. I will be back to share the wee ones costumes (that still need to be completed). I have not had a lot of time to sew, I sew/knit/crochet as much as possible, but life (and it is a good life) does come first. This morning I woke up early to write minutes for my local community club. This is one of my normal gigs. As soon as I sat down, I found two little animals wanting to be by my side. I moved the pet bed to the kitchen, our home office is in the kitchen, and they happily slept beside me as I worked. While I would rather be sleeping at that time of day, there is something beautiful about being awake and experiencing the peace that is felt in a home full of happy sleeping children (and pets). Blocks 3 and 4 would have been done on the weekend if I did not run out of thread! I knew I was going to run out and I still didn't pick any up when I was at the fabric store earlier in the week. 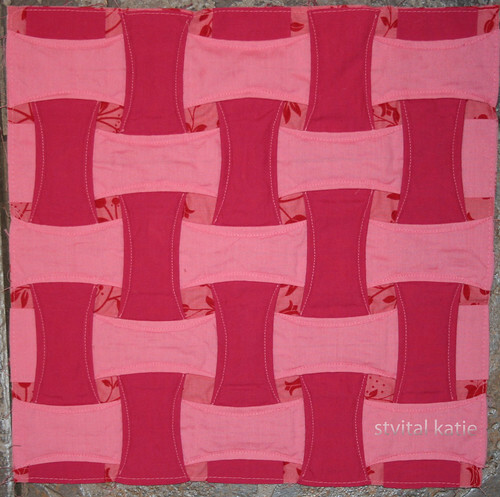 I struggled with fabric selection for Block 3. I could not find anything in my stash that felt right and I gave in and bought a fat quarter. 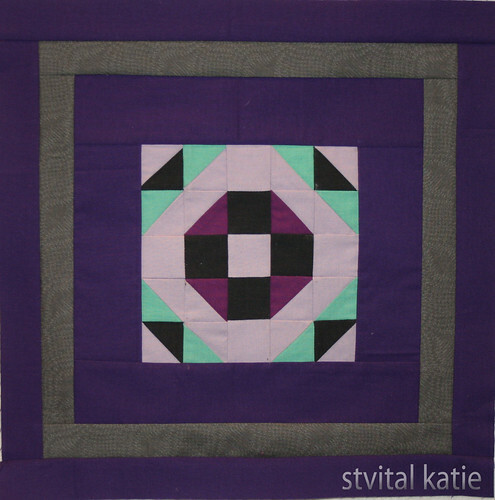 The fat quarter is featured in the 3 squares. Apparently my local fabric store only has candy pink fabric, my existing fabric is not. I found this at *cough* *cough* Walmart. I am not proud, but it works. The instructions for Block 3 can be found here. 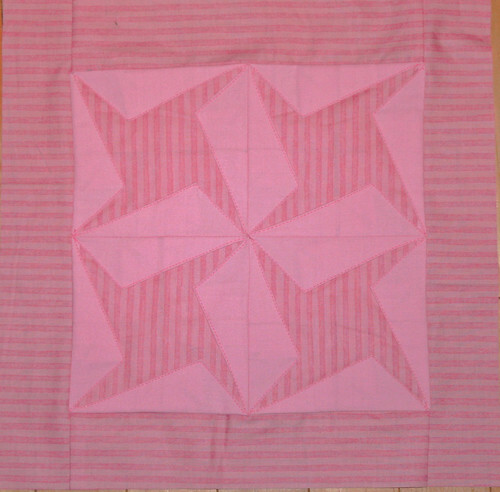 Block 4 looks wrinkly after I ironed it. I am guessing I should not have done that. Again, I am struggling to keep things all pink, this being such a plain block left me searching, I think it worked out well in the end. The instructions for Block 4 can be found here. 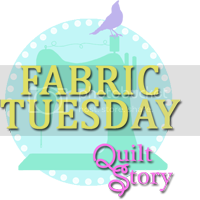 I have two fabric swaps to share with you today, both of which I plan to participate in! Swaps are now closed. I built a few more blocks up. I am sure my daughter wishes I had them all done, but I get too distracted. I like to jump from one project to another, then back again. Eventually I finish what I start! 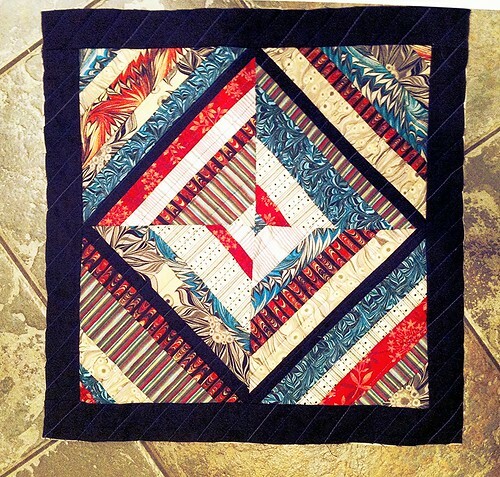 I finished the second block in the quilt a long. I am hopeful that I will have time to work on them all, but time will tell. So far I am doing well at finding fabric in my stash. 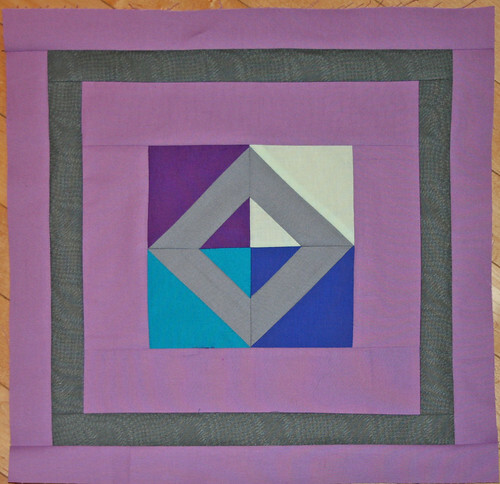 The blocks finish at 12" and there are 9 blocks in total. Check out the Flickr group to see what others are making, or join in yourself. The instructions for Block 2 can be found here. I have always wanted to make cathedral windows and now I will. 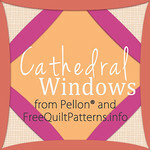 I have joined the Cathedral Windows QAL. I am not sure if I will be able to keep up, but I have completed Block 1. I am using fabric that I have in my stash, I seem to have a lot of pink. I have no idea where it all came from. 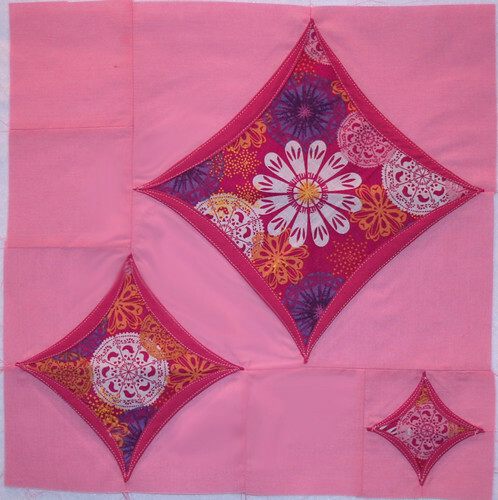 It is not the best quality (the solids) but I think it will work great for this quilt along. The instructions for Block 1 can be found here.